If the Skills Survey determines that a child requires additional keyboard skills to smoothly use the program, he or she is guided to the Letter Land format. 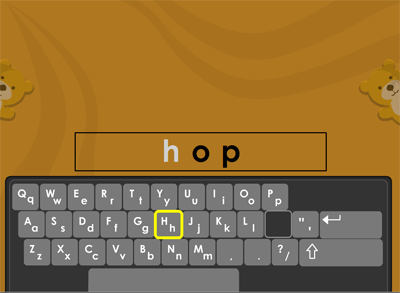 Letter Land develops the ability to type the letters and punctuation keys on the keyboard in a smooth, efficient manner. This does not require 10 finger touch typing, but rather having an effective mental map of where all the keys are and how to effectively use the keyboard. It's a skill that is essential for using ASD Reading and, given the prevalence of computers in today's world, it is also an excellent skill for children to attain early. It is important to note that while a child may already possess some reading abilities, if he or she is not yet able to use a keyboard in a smooth, steady manner, the child is guided to this format. 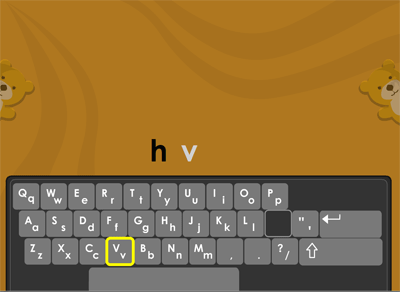 Building up from one row of the keyboard to three rows, a child learns to rapidly locate the letters and punctuation keys as well as the appropriate use of the shift key. A child is first asked to type some letters or punctuation and then is asked to complete a word using one of the same letters.